"I had a small job, but they treated me like a large job." 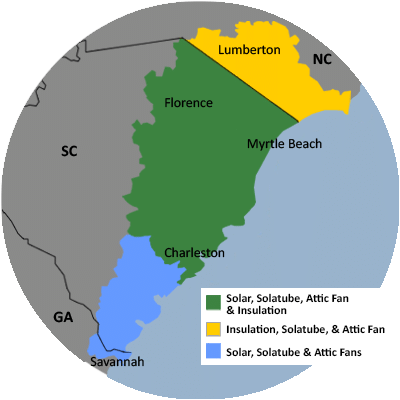 For a FREE no-obligation estimate in Brunswick County, NC, please fill out the form to the right and Carolina Energy Conservation will contact you shortly. We specialize in a variety of services aimed to lessen your home's carbon footprint and save energy and money each month! We offer it all, from air sealing to ductwork to insulation and HVAC services in Brunswick County, NC. For a FREE, no-obligation services estimate in Brunswick County, NC, you'll also receive a free copy of "Saving Energy and Money at Home," a great book to use as you begin to create a more comfortable, healthy, and energy efficient home! A full encapsulation, including a dehumidifier, will eliminate mold and allow more comfort to your home. Encapsulating your crawlspace provides a moisture barrier between the Earth and your home. Doing an air seal before encapsulating the crawlspace ensures that excess outdoor air and moisture will not waste energy. Libby of Supply, North Carolina noticed that her attic was lacking the proper amount of insulation. There were also some areas of the attic that she could feel her cool air conditioning flowing through to the attic. She didn't want to waste anymore energy by having her HVAC system work extra hard keep the home cool, as the cool air was escaping through the attic. She gave Carolina Energy Conservation a call, and after evaluating her attic, the crew decided to do a complete air seal and blow in more insulation. First, the crew removed the existing insulation, then air sealed any potential penetrations using an expanding polyurethane foam. After the air seal was completed, cellulose insulation was blown into the area filling in even the hard to reach spaces. While they were there, the team installed a solar powered attic fan to help maintain the attic temperature. The attic fan will keep the attic the same temperature as outside so that the HVAC unit will not have to work so hard to cool the home below. Libby M. was happy with the outcome of her attic space and does not have to worry about improper insulation for several years to come!